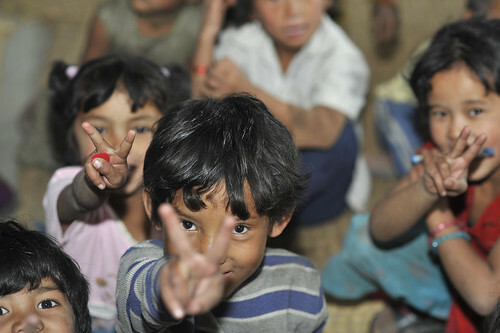 At Friends for Asia we firmly believe that the path to a brighter future for Nepali children lies in education. Volunteers in our Teaching English Project make a real difference to the lives of Nepalese children by advancing their English language skills, making it easier for them to enter employment and further education in the future. This project is all about the kids, but make no mistake, this will be a valuable learning experience for volunteers and students alike. Our volunteers are placed in Government (public) and community schools so most follow the normal school day, though some projects do involve teaching during non-school hours. Classes typically run from 9.45am to 4pm. The average day will involve a number of classes where reading, writing, song and conversation will all be used to help the children improve their English abilities. Volunteer teachers often work in tandem with Nepalese staff to make the learning experience as beneficial as possible for the students. In most cases volunteers are expected to teach basic English. Advancing their vocabulary is particularly important at this stage of their learning and teachers are encouraged to use songs, dances and other activities to make the experience as fun as possible. A friendly, outgoing personality is a plus, as it will help the kids get over their initial shyness. Though teaching class will be the mainstay of your duties as a volunteer in Nepal, you may also find yourself drafted in for other work at the school. For example, if your students are preparing for exams you may be asked to help out with the preparations. Nepali teachers are friendly and welcoming, and will be open to trying out new and innovative teaching methods. As an English teacher in Nepal your top priority will be to advance the children’s language skills as much as possible during the duration of your stay. This will be both challenging and rewarding, and will enrich the lives of both you and your students. For the children the mere exposure to a western or native speaker of English is of huge benefit, while the progress made through new teaching methods is also a major plus. The ability to speak, read and write in English is becoming more and more important in Nepal and is fast becoming a required skill for job placement and educational advancement. Anything the children learn in your class will benefit them significantly in years to come. Not only can you enrich the students’ lives during your time in Nepal, you can also help the teachers. Repetitive learning is still common practice in Nepal. For our volunteers, this is an opportunity to bring new and fun teaching practices to the classroom and exchange thoughts and ideas with Nepalese teachers. The minimum age requirement for volunteers in this project is 18. No formal teaching qualifications are required to teach English at a Nepali school. We do, however, ask for our volunteers to be fluent in both written and spoken English and have plenty of enthusiasm, initiative and patience. Participation in the Teaching English Volunteer Project starts at $750 for two weeks. Each additional week is $80. Plane tickets, travel insurance, cost of transportation to and from work location and accommodation.